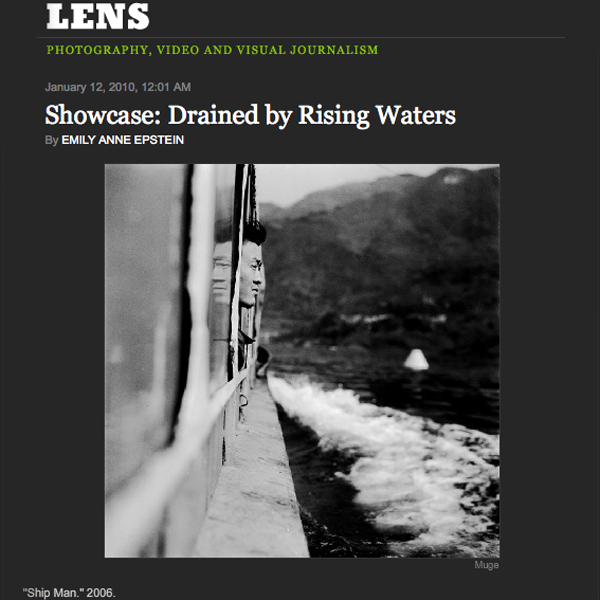 In all the coverage of the enormous Three Gorges hydroelectric project on the Yangtze River, and the creation of a vast reservoir that has displaced hundreds of thousands of people around his birthplace in Chongqing, the photographer Muge Huang Rong felt the lack of something very important. And personal. “I saw many images about Three Gorges, but could not find a familiar emotion — one that belonged to me,” said Muge, as he is known professionally. Now 30 years old and living in Chengdu, Muge has just spent four years on “Go Home,” a look at the lives that have been disrupted by the construction of the Three Gorges Dam. “Home, for me, has too many meanings,” Muge said. “On one side is demolition, explosion, collapse; mixed with noises and flying dust. On the other side is my childhood memories.” This tension is apparent in his portraits, in which people inhabit desolate landscapes. The intimacy of the subjects’ relationships with one another — depicted in embraces, gestures and gazes — contrasts starkly with the rubble and refuse piled in the background. The unusual feel of the images owes itself in part to Muge’s Soviet-era Ukrainian camera, a Kiev 60. It is a “very cheap, very simple machine,” Muge said, and adds an antique quality to the photographs. A comparison can be made between Muge’s photographs and those of Lu Guang, winner of this year’s W. Eugene Smith Grant in Humanistic Photography for his project, “Pollution in China.” Mr. Lu’s sweeping panoramas and Muge’s closely cropped portraits depict two sides of China’s problematic progress. “Lu Guang’s photographs point out many realities,” Muge said. “But he also ignores many of our emotions.” When viewed together, the photographers’ differing compositions become complementary. Mr. Lu adeptly expresses the loss of natural environments, while Muge focuses on the loss of a way of life. Even though landslides, floods and disease have made life around Three Gorges nearly impossible, Muge captured the resilience of the community. The people he photographs are not defeated; they look outward — outside the frame, beyond the immediate circumstance.